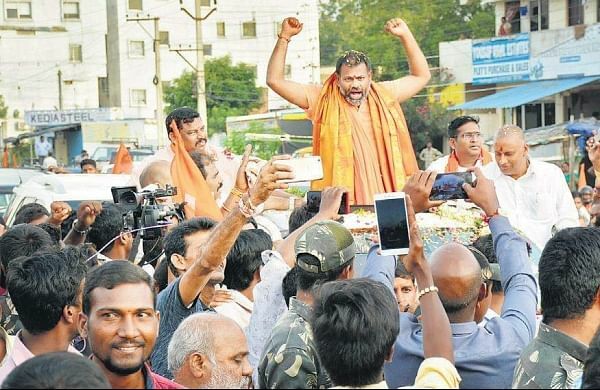 HYDERABAD: Swamy Paripoornanda, the seer of Sri Peetham in Kakinada, was welcomed with much fanfare on Tuesday.Peering out of the sunroof of an SUV, accompanied by a sea of followers waving saffron flags from Vijayawada to Hyderabad, Swami Paripoornananda came back to Hyderabad, his second home. On August 14, the Hyderabad High Court had suspended the six-month externment order issued by Hyderabad police. What could be a five-hour journey, covering a 275 km distance between Vijayawada and Hyderabad, took more than 10 hours of travel time on Tuesday. The reason: groups of people joined the convoy at all major junctions across the stretch to take blessings of the Swamy. “Be it Suryapet, Chityal, Kodad, Narketpally, or Hayathnagar, people have come with just a simple message. It’s not just members of BJP, Bajrang Dal, VHP, or Hindu Vahini, even his devotees have come in scores,” said Kailash Sajjan, spokesperson, Bajrang Dal. The saffron flags accompanying him all through the route also point at a possible elevation of Paripoornananda to be the face of BJP in the coming elections. “Unlike the TRS which had booked buses to bring public for Pragati Nivedhana Sabha, people came voluntarily for him,” said NVSS Prabhakar, MLA from Uppal. Due to the procession, vehicular movement took a serious beating on NH-65 as traffic moved at snail’s pace. In addition to the large number of vehicles of supporters, police personnel from Telangana and Andhra Pradesh provided security to the seer.